Let customers quickly find the brands they love with a user-friendly brands showcase. Increase your sales giving users better shopping experience with unique and fully custom brand pages. It's not a secret, that sometimes particular brand names speak louder than any advertising texts. Therefore, thousands of customers come to online stores with one particular goal - to find products of a specific manufacturer. Why not help such visitors to instantly get what they need by showing them the quickest path to their favorite brands? Due to the Shop by Brand Magento extension a store admin can easily add a handy block with brand names and logos to the sidebar as well as display brands in the top navigation menu, thus helping customers to instantly browse your Magento store by popular brands. Create custom pages for each particular brand and equip them with stunning logos, catchy texts and SEO-friendly URLs. Generate a brand listing page with a featured brands slide-show and a smart search box that auto suggests the most relevant brands when customers start typing in. Add a Brands link to the Main Menu bar and Top Links. Create a listing page with all Brands listed alphabetically. 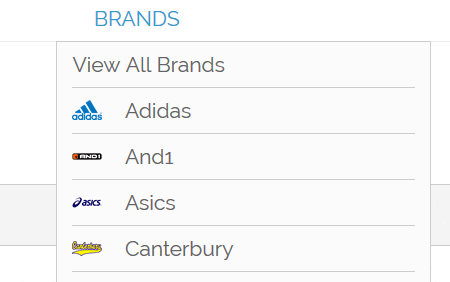 Feature brands by adding them to the Brands slider. Let customers find brands with a quick search window. Upload custom images and different logos for sidebar, top menu, slider and brand listing page. Show available products quantity for each brand. Customize content for each brand page. Generate short SEO-friendly URLs for brand pages. Import and export brands in CSV format. All brands are created based on specific product attribute values. Each attribute value is equal to a new brand. Products with a specified attribute will be assigned to new brands automatically. Shop by Brand Magento extension settings let you display an additional link to a brand listing page with brand names and logos right in the top menu. This way online shoppers will be able to sort store items by brand not only from category pages, but from any store page including personal customer accounts. 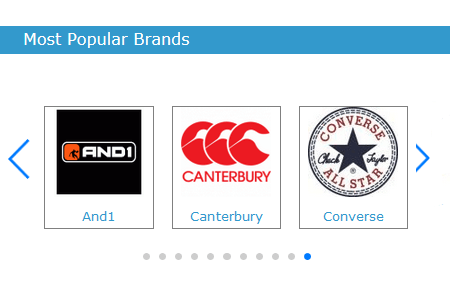 With the Magento brand tool an admin can show all created brands with their logos in the left sidebar. Once store visitors click on a specific manufacturer from the brands list, they will get redirected to the corresponding brand page with the products they need. In case you've got a rich list of brands help customers to quickly find a specific brand by placing a search box in the left sidebar and on a brands listing page. Enjoy the auto suggestion with the most relevant brands when start typing the first letter of a particular manufacturer into the search field. This easy-to-use Magento 'shop-by-brand' tool will help customers decrease the time spent on brand browsing and focus on the items they need. Gather all brands you offer on one page. Arrange brands in alphabetical order and/or filter Brands by first character to help customers easily browse through numerous manufacturer names. Show custom brand logos and labels together with the number of available products for each brand for better content perception. Configure the Brand Listing page style by choosing a header's color and a text. Add a brands slider to a product listing page to draw customers attention to the most popular manufacturers and increase the number of spontaneous purchases. Configure flexible settings to adjust slider images and header display to your specific requirements. To make Magento manufacturer pages informative and catchy equip them with a brand title, logo and description. Use a wysiwyg tool to accurately edit brand page texts. Add a brand banner and a video via cms block. Allow filtering products by size, color, material, price, etc. Create short nice looking URLs like your-store.com/brand-name.html for each brand page to improve your store SEO. You can also specify necessary Meta data such as keywords and descriptions for all pages to show relevant information in SERP. As soon as the extension lets you choose any attribute as a brand, you can use the module for a great variety of purposes by letting customers shop by any attribute in your Magento store. E.g. Shop by Sport Team, Shop by Player, Shop by Musician, Shop by Book Author or any other product attribute depending on your store specifics. Speed up brands management by importing all brands in one go using a CSV file. This feature is extremely useful for huge stores with numerous brands. Apart from that, you can also easily export brands data for further processing. Take full control of site content management. The Magento brand extension lets you place a brand listing block and a slider on any CMS page or a static block by inserting a special embedded code. Let your visitors choose products of a certain company on the Brands page and directly add them to the cart placed on the same page. Customers often make their decision based on the Brand. I believe this is the most feature rich Brands functionality on the market. It has beautiful listing page with all the brands and the slider. It is possible to auto generate brands based on any attribute or to import them quickly. I love the the SEO friendly URLs. This is that i need! Really worthy tool if you sell brand products. It appeared to be very easy to configure, although we still had to apply to support guys coz the slider needed to be modified for our store theme. Anyway, the app deserves 5 stars due to its handy interface and prompt support service.